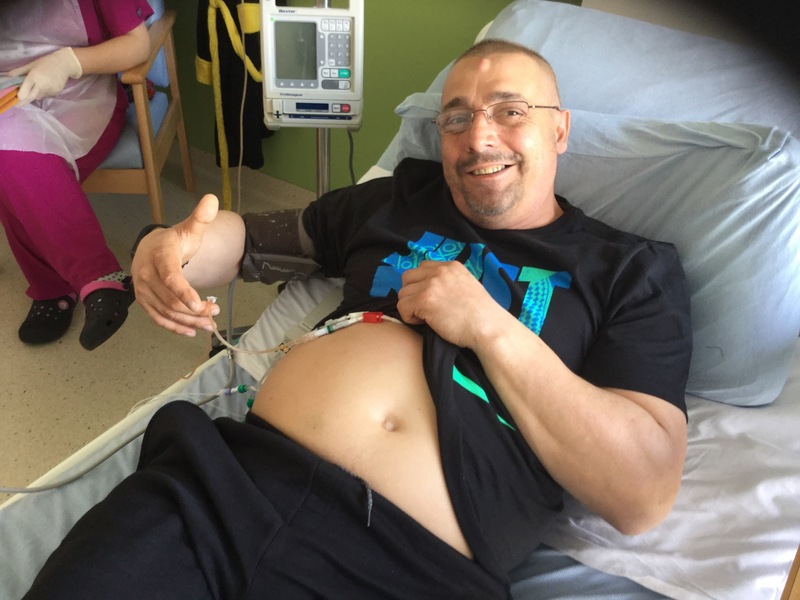 I remember turning up at the allocated time and walking into the ward where there were 4 doors to 4 rooms with ensuite facilities, my nurse came to the door on the 7 th floor of the royal Liverpool hospital and took me to the room where I was to spend the next 3 weeks minimum in isolation. The nurse was very pleasant but I remember breaking down completely on entering that room. I sobbed like a baby that I had to go through this nightmare, that I even had cancer. Cancer is without doubt the hardest thing I have ever faced. The first thing you have to do is completely trust in the staff that they know what they are doing whilst maintaining your dignity. You also have to make sure that they do what you need them to for you to be comfortable too. The first night I went home as it was only a night's sleep. 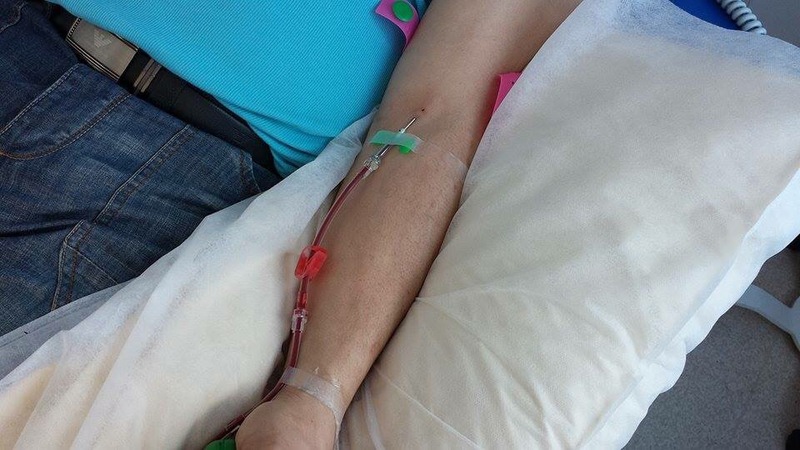 I then came back to the hospital the next day for my Hickman line placement. People say it's easy and not to worry but that's easier sadi than don for a control freak like me who finds it hard not being in control of anything let alone my life. It just seemed to be a never ending line up of fights that I had to take on and win. I was tired going into that room - weary from everything that I'd already been through. 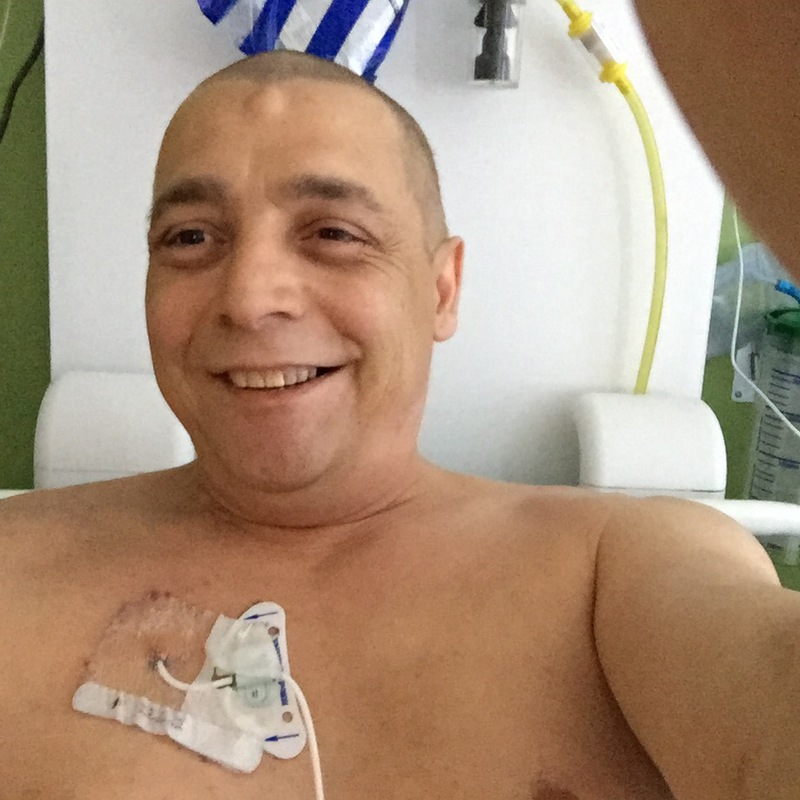 The first blog I wrote in hospital I wrote with gritted teeth: "I AM MARK, A CANCER FIGHTER. I WILL WIN." As far as I was concerned it was impossible to do. However I had support from friends and family and they really helped support me. There was one person who was there for me no matter what and she stayed by my side through all the fear, through all the fights. She held my hand as I cried out not knowing how the chemo would effect me. Friends, too, would call me as well as my ever faithful Dad who contacted me everyday without fail. Friends who called me up and made me laugh. I did press ups and walked everyday with my drip attached determined as I was determined not to lose any muscle. I ate and ate even though I had ulcers from lips to rear. I cried like a baby with every mouthful. I believed by faith that there was a reason for all this suffering and hoped every hour I would get out alive. I had smoked right up until I went in that room but have never touched a cigarette since. My wife would come every day about 11 with my Costa coffee and leave at the latest possible time everyday. It's hard writing all this and looking back at such a difficult time in my life but I want people to know that there is light at the end of the tunnel. I used twitter, Google and other methods to find positivity. Putting positive words in search boxes, holding hands with my wife as my body shook in pain. Eating and drinking water are the most important things that you can do while you're in hospital - they are vital for your recovery. I remember that whenever Andie left for home I would go to the toilet and find her gone when I came back out. I could never watch her leave. You just find ways to cope, even using tranquillisers to put me out a bit sometimes although not often and never relying on them. Then there was the miraculous day 184 days ago when my stem cells went back into my body on May 22nd, I remember it being a warm feeling. A feeling that gave me strength, it gave me a feeling of hope and freshness. It was a clean feeling, like I had been washed by chemo. I will tell you more about how it felt to be neutrapenic at a later date but for now be encouraged, and know whatever you fight is for a reason. That's it's worth it. Above all you must always believe it's possible, no matter what. Reach out to your friends and family. That's what they are there for. All views are my own and based on my own experience and opinions. I express them here to encourage you. Please share with others, if it meant something to you it will to someone else. It sounds like you had a lot of support from friends and family whilst you were having transplant and I really admire how you tried to remain active even when you had hardly any energy and everything was sore. I was the same asking for an exercise bike even though I couldn't pedal for more than 5 or 10 minutes when I was at my lowest. How did you cope with the mouth sores? Were you on much pain relief? I kept mine as low as I possibly could as I hated the morphine.